From the private jet wakeboard to the world’s first passenger drone, scientists and inventors are constantly coming up with new and creative ways to help us get from A to B. 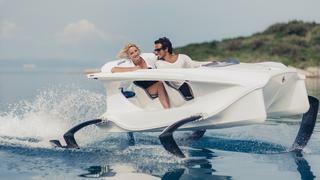 While your superyacht garage may already be full of the best jet skis and the world's fastest superyacht tenders, the recently unveiled Quadrofoil personal watercraft may have you tempted to find a little extra room. This electric personal watercraft sits somewhere between a jet ski and a tender and promises clean, efficient and eco-friendly travel at speeds of up to 20 knots. The lightweight modular hull sits on top of four hydrofoil arrays that use natural buoyancy to lift the vessel and reduce water resistance while allowing optimum control and manoeuvrability. 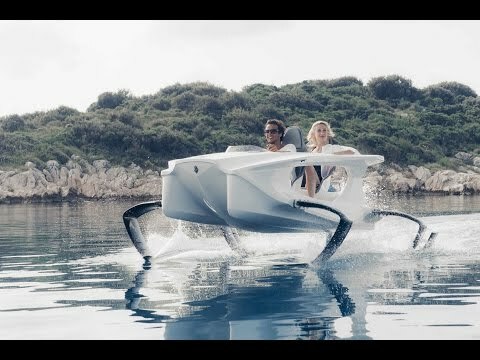 The Quadrofoil is powered by an integrated battery system which offers a range of up to 100km in a single charge, along with a silent motor and zero emissions, which permits the vessel access to protected eco-zones where tenders and other watercraft are not usually allowed. The watercraft has also been designed with owner usability in mind. The Quadrofoil is controlled via a steering wheel with an integrated touch screen display that provides information on battery power, range, speed and consumption. The display also functions as detachable key and without it the vessel cannot be started. Of course, with all personal watercraft of this kind, safety is key and the Quadrofoil has undergone rigorous testing to ensure it is safe for everyday use. Key features include an in-built anti-collision system that absorbs the shock of potential crashes and, because the hull of the Quadrofoil is hollow and its foiling system allows for sharp turns without fear of flipping over, the vessel’s manufacturers also claim it is unsinkable. Available as an entry level Q2A or a more powerful Q2S model, the Quadrofoil can seat two people and has a length of 2.9 metres and weight of 100kg. Both models are available to order now from €15,000 with delivery expected in May 2016.